Needing some pointers on how to help accelerate your brand and race team promotional efforts for the upcoming season? 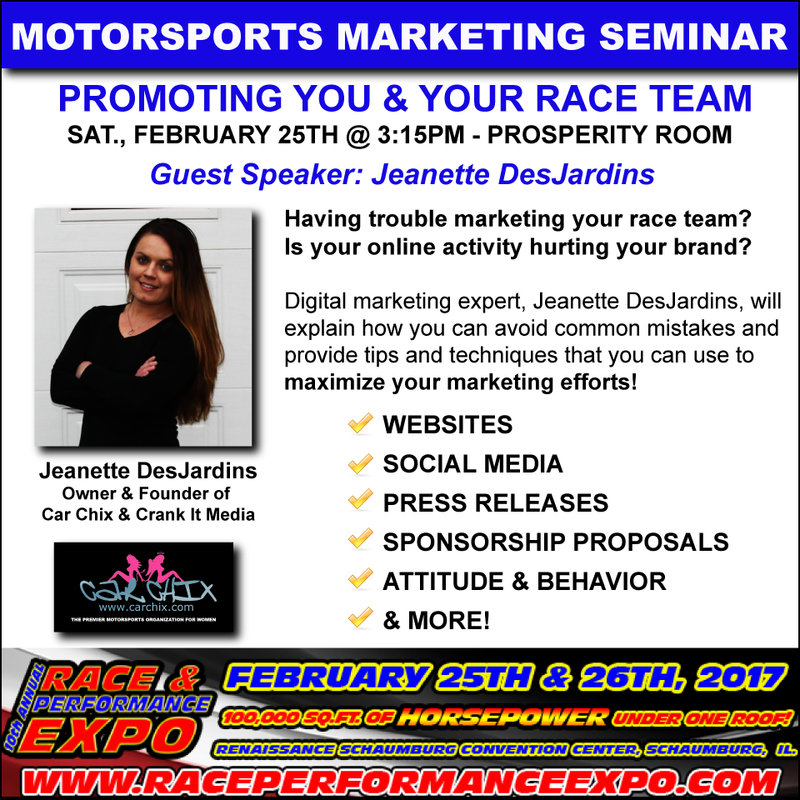 Car Chix Founder & President, Jeanette DesJardins will be presenting the Motorsports Marketing Seminar – Promoting You and Your Race Team during the 10th annual Race and Performance Expo on Saturday, February 25th, 2017. 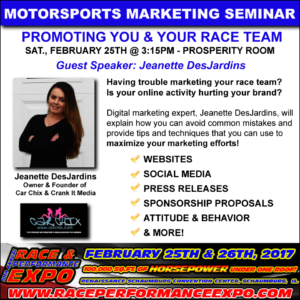 The Digital Marketing Expert will lead an information-rich seminar on maximizing marketing efforts for your race team, avoiding common mistakes in the digital landscape and actionable tips and techniques to use in your 2017 motorsport marketing plan. The Motorsport Marketing seminar will include pertinent information on the use of Social Media, the importance of professional press releases, best practices for crafting successful sponsorship proposals, and the necessary off-track work involved for generating team success on and off the track surface. Moderator Jeanette DesJardins is the founder and president of popular women in motorsports trademark and website CarChix.com; as well as the founder and president of Crank It Media, an internet marketing company specializing in the motorsports, automotive, industrial and entertainment industries. DesJardins recently was a featured panelist during the ‘Women in Motorsports’ Seminar at the industry-staple 2016 Performance Racing Industry (PRI) Show in Indianapolis, IN. She has earned accolades for Outstanding Leadership in Women’s Motorsports by Memphis International Raceway, and the President’s Award from Cordova International Raceway for her contributions to the sport and advancing women in automotive. The Race and Performance Expo takes place at the Schaumburg Renaissance Center February 25th -26th in Schaumburg, Illinois and is open to the public. The Motorsport Marketing Seminar will be held Saturday afternoon, from 3:15pm-3:55pm in the Prosperity Room. All expo seminars are free of charge to expo attendees.